Welcome to The Wild Blog! I’m so proud to introduce Wild Moon Consulting! I’ve renewed my focus on and enthusiasm for working with organizations that do organizing and advocacy, that are in the trenches every day making this a better world while keeping their eye on the big picture of systemic oppression, and that struggle with minimal resources and need just a bit of help to be successful. I’ve been working for many years under the name Crazy Horse Consulting; however, I recently realized (late, yes, I know) that using the name of the Lakota chief for a white woman’s business smacked of cultural appropriation. As a Lakota friend noted, Chief Crazy Horse wanted nothing to do with non-natives because he was so traditional. It was clearly time to find a new name. If you want to read more about cultural appropriation and why it’s a problem, especially when us whites do it, you can read a great article here from the Everyday Feminism site: http://everydayfeminism.com/2015/06/cultural-appropriation-wrong/. If you have other links to articles/blogs about cultural appropriation, please feel free to leave them in a comment. The name Wild Moon Consulting came from a dear friend I know from old ACORN days. She’s still out in the streets, working on gentrification and fighting for justice. You can check out her organization A Community Voice at their website http://www.acommunityvoice.org/. I saw an ad the other day for a grant writing workshop. Nothing unusual about that, but this one was on how to customize your proposal for a particular funder. My curiosity kicked in, because I thought all nonprofits customized every one of their proposals for each individual funder. So I clicked on the link. Read the first sentence of the description and did a Scooby Doo-style neck twist. Huh? Because, much to my surprise, it said that many nonprofits send out mass mailings of the same boilerplate proposal to many foundations. Hmmm. In 20 years of writing hundreds, if not thousands, of grant applications and proposals, I have never once been able to take a proposal I sent to one funder and send it unedited and unchanged to another. Never. Don’t get me wrong. Boilerplate language is the grant writer’s best friend. And Program Officers have told me many times that it’s theirs, as well. They LIKE getting similar reports and applications from the same organization over time because (a) it indicates consistency and (b) it’s easy for them to see if the organization has changed something in their mission or core programs or long-term planning. Using boilerplate language is also amazingly helpful for nonprofits and grant writers because it means we can write a LOT of proposals – each tailored to the specific funder – in a relatively short time frame. And we don’t have to type and proofread everything every time. I encourage all grant writers and nonprofit executives to develop a good set of boilerplate language for the overall organization and for each project and program. This ensures a constant and handy source of text for applications, donor letters, press releases, and many other uses. And it’s great if there’s a surprise opportunity and not much time to write something new. The foundation application process has hundreds of variations. Most of the proposals and applications I write these days are for foundations with wide variations in how they want the application structured. Some have web-based forms with very tight word or character limits. Others require an emailed application using their form and a narrative with various attachments. A few want a LOT of attachments or only one or two. And many require a signature from the Executive Director or Board officer, or both, provided either electronically or on a paper form. While all of these variations also ask quite different questions or require very specific information, having language at your fingertips will make the process much easier and result in more applications. Which will, in turn, result in more grant funding. And that, as they say, is what it’s all about. To go back to the first point, while boilerplate language is great, sending out the same proposal to many foundations is a waste of time, paper, ink, and postage. And it’s annoying to the recipient (more on that in the next blog post). Foundation fundraising is partly about numbers. You want to send out lots of proposals and letters and applications. But you also want them to be pertinent to the foundation receiving them and, of course, ultimately, you want them to be funded. The answer is to have good, well-thought-out boilerplate language that you can adapt quickly and easily and to know what can and should change and what should be the same. To help you figure that out, here are two lists. One is what should change for each application; the other is what should not. Okay three, because I’ve also included a short list of what you should probably write brand-new each time. * These can be edited for length and various goals/objectives can be included or not depending on the foundation’s guidelines and the application’s space limitations; however, the actual goals and objectives should remain consistent across applications. ** Board lists can include different information (contact info, affiliation, term info), but the actual list should be the same. These are meant to be a starting point for those who are just beginning to write grants for their organization. If you’d like some coaching in putting together your boilerplates, or even conceptualizing your work so you can write it up in a narrative form, I’m here. I’ve worked with many new nonprofit executives and many who were new to foundation fundraising and have developed a system that will help you outline your needs statement, goals, and objectives – for your organization and for any projects or programs. I can also write the boilerplate language for you, which will make it possible to do multiple applications and proposals on your own. Just head to the contact form or give me a call and we can get started right away. First off, this isn’t about being earnest or even being Ernest, whoever he might be. It’s about the importance of proofreading. I got an email awhile back from a big nonprofit industry publication that spelled the recent award given to Bob Dylan as the “Nobell Prize.” This is not the first typo I’ve found in one of their messages. Or the second. Or even the third. Worse, I see typos and weird characters in emails and Facebook posts from nonprofits all the time and it’s more than an annoyance. For the senders and posters, it’s a problem. As we all know, the competition for donor and foundation dollars gets stiffer all the time. There are more people, animals, environments needing help every single day and there are more and more nonprofits asking for a finite amount of money from a finite number of donors and foundations. Advisors will tell you to “stand out from the competition.” Good advice, but I’m pretty sure this isn’t what they had in mind. You want to stand out in a positive way. Why is it important for nonprofits to present the best “face” possible? We humans form opinions and judgments all the time based on the information we get and attribute characteristics and values to others. It’s how we try to explain the world to ourselves. For example, if my coworker Annie shows up to work late three times a week, I’m likely to attribute various characteristics to her based on her tardiness. Some of it depends on other information we know about the person, so if I know Annie has two young children, I might wonder if she’s overwhelmed. But if I know nothing about Annie, I might think she’s disorganized and unable to get herself together to show up on time. To apply that to the emails I mentioned above, after more than four or five typos and misused words, I might be less inclined to view that organization’s information as solid and reliable. If they can’t spell “Nobel” correctly, what other facts are they getting wrong? Do they check their facts the same way they proofread their news messages? As for fundraising emails, a donor might wonder if a nonprofit that consistently sends out messy-looking emails or messages that have typos and misused words is able to keep on top of their financial and program obligations. Are they organized and reliable and will they be around in a year or two? Do they provide good services or information? Is their messaging trustworthy? Most funders and donors value well-written and -edited correspondence and proposals. I heard about one who sent a proposal back to be rewritten! Even casual social media readers make attributions about the source of posts based on grammar and spelling. Write everything in Word and run a spell-check. THEN copy and paste into Facebook or a web interface. Ask someone else to proofread what you’ve written. If you need to proofread your own work, read it backwards. You can also create a PDF of what you’ve written for proofing. For me, the different visual helps find small typos and mistakes. Check lists and numbers, and then recheck them. Send your emails to yourself using various platforms, including Gmail, squirrel mail, Outlook, and others and check for problems. This will also help make sure that any graphics you’re sending are in the right place and any formatting (bold, italic, etc.) looks how it’s supposed to look. To keep odd characters out of emails, use the “paste as plain text” function if your program or interface has that option. Here’s an article from MailChimp about this problem and how to fix it: http://kb.mailchimp.com/campaigns/design/i-have-strange-characters-in-my-content. 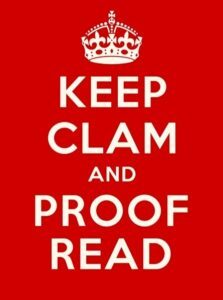 Don’t forget to “keep clam”! Finally, if you know you need more help than these few tips and are interested in professional editing and proofreading, click here and send me a note. I’m happy to help!